Synopsis (Goodreads): To the children, the town was their whole world. To the adults, knowing better, Derry, Maine was just their home town: familiar, well-ordered for the most part. A good place to live. This was a ride! A huge ride! This is a book that will stay forever with me, getting to know the characters so well and never forgetting that terrifying face of Pennywise the dancing clown. Getting to know a group of friends: Bill, Ben, Beverly, Mike, Stan, Eddie and Richie. In the beginning I had a little problem with the change from the children to the adults. I found the adult’s story harder to get into, having a seperate introduction for each adult which were quite long as well. Eventually when the stories started to progress, I got more into the adult’s story as well. Especially when IT made it’s way into the adult’s story. The change between the stories was also placed amazingly well. Picking the moment when you wanted to read further so bad, the children’s story ended and the adult’s began. It made me hungry to keep reading. It was really clear that the adult’s side of the story was a mean to end the story, while the children’s side was were we would see the most gruesome and terrifying side of IT. IT. Most people know IT as a terrifying, scary clown. Definitely not the one to find at a children’s party. Everytime IT made an entrance, it was nightmare material. I’ve never seen the movie, so I went completely blind into the book only knowing about IT as a clown. What I didn’t know was that IT can take many forms. That changed the whole look at the story for me. I expected a clown throughout the whole book, but I didn’t mind the change in form. It made the plot more interesting and gave a lot of opportunity for scary situations. 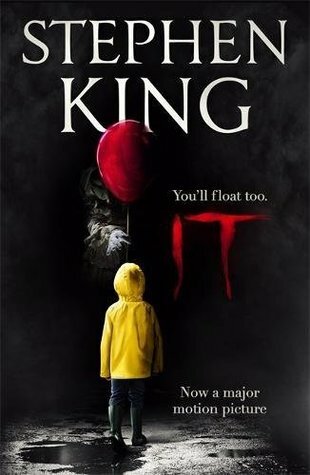 In the end, I do love the Pennywise version the most. It’s the scariest to me and most entertaining. The length of the book was intimidation but also made me really getting to know the characters of the losers’ club. I loved that I got to know the story of each of the characters individually. I liked Ben Hanscom a lot, the boy who didn’t belong with anyone, but then managed to have a whole group of close friends. One thing you have to know when reading this book, is that there are long chapters with a lot of background information about the characters and Derry. It can look dready something, but it also adds a lot to the experience and makes a complete image of everything. I did find it sometimes a bit boring though. One thing I’ve seen some people write about, is the little amount of adults/parents we hear about getting involved in the story. I agree with that. I believe it made the whole book more terrifying, because the parents appeared blind to the whole IT situation. Even though they knew about the missing children, they wouldn’t believe the story about a scary clown and they tried to almost ignore it completely. The little amount of focus on the parents also made this story appear just through the eyes of the children, which added to the scariness. The scenes of IT were very clever. The description of the scenes were so lively and detailed, which made it appear like a real nightmare. The classic scene about the death of George, for example. Everything in the book was written so well that it could’ve been made into a movie amazingly, which eventually happened a couple of times. The ending was completely different than what I expected. Also because I didn’t know IT would take more forms. On the other side, it did end in a place were I would have expected the story to end. Maybe a little too sci-fi for me, but I still found it amazing. Let me know what you think! Have fun reading!